Acclaimed guitar duo Sérgio and Odair Assad present a "Journey of the Brazilian Guitar through History," Nov. 10 at 8 p.m. Photo by Fadi Kheir. Emory celebrates music from around the world this month — from Poland's national orchestra to a Brazilian guitar duo to a French master organist, among many other talented musicians in November. Join graduate Brian Glikes as he performs his organ recital on Tuesday, Nov. 6 at 7 p.m. The Vega String Quartet will perform the world premiere of a new work by Czech composer Jan Jirasek on Friday, Nov. 9 at 8 p.m. The program, presented by the Emory Chamber Music Society of Atlanta (ECMSA), will also include string quartets by Tchaikovsky and Beethoven. 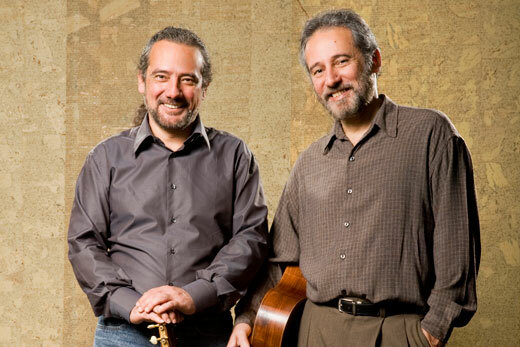 On Saturday, Nov. 10 at 8 p.m., the guitar duo Sérgio and Odair Assad — acclaimed for their innovation, ingenuity and expression — present a "Journey of the Brazilian Guitar through History," featuring classical, waltzes, chôro, jazz and bossa nova. Prior to the concert, Sérgio Assad will give a pre-concert talk at 7:15 p.m. Tickets: $45; $36 discount category members; $10 students. Graduate Jonathan Easter presents an organ recital on Sunday, Nov. 11 at 5 p.m.
For over 30 years, Maurice Clerc has been the organist of the Grand Organ of the Cathedrale in Dijon. He will perform on the refurbished Casavant Organ in Glenn Auditorium on Tuesday, Nov. 13 at 8 p.m. The Emory Youth Symphony Orchestra will present a concert on Wednesday, Nov. 14 at 8 p.m.
Pianist William Ransom presents "My Favorite Repertoire" of Chopin, Beethoven and Gershwin in an ECMSA concert at the Carlos Museum Reception Hall on Friday, Nov. 16 at noon. For all undergraduate music majors, the Emory University Department of music will host the annual Concerto and Aria Competition on Saturday, Nov. 17 at 7 p.m.
Director Eric Nelson leads the Emory Mastersingers on Sunday, Nov. 18 at 4 p.m. Student conductors from the Graduate Choral Conducting program include Joel Thompson, Meg Granum, Tyrone Webb, Caleb Lewis, Harris Gessner and Evan Wichman. The Vega String Quartet will perform pieces by John Anthony Lennon's student composition class on Monday, Nov. 26 at 1 p.m. in Tharp Rehearsal Hall in the Schwartz Center. The pieces were inspired by the 2011-2012 Water series. Earlier this month, artistic director Antoni Wit led the Warsaw Philharmonic with the 2010 Chopin Competition winner, Yulianna Avdeeva, performing on piano. Junior Melanie Zhang performed a full flute recital; and the Atlanta Trumpet Ensemble presents the Trumpet Festival Concert, featuring literature for solo trumpet, jazz trumpet, and trumpet in chamber music and the Trumpet Festival Gala Concert, featuring festival participants from middle school on up. All concerts are free and take place in the Schwartz Center for Performing Arts, unless otherwise noted. For tickets and event information, visit arts.emory.edu or call the Arts at Emory Box Office at 404-727-5050.